Gretsch honors original-era master Cliff Gallup, whose tastefully fleet-fingered work hot-rodded dozens of classics by Gene Vincent and his Blue Caps in the latter half of the 1950s. Soft-spoken in manner, Gallup was anything but with a Duo Jet in his hands, turning in solos and backing tracks of startling proficiency and truly raising the bar (and the roof) for rockabilly and early rock ‘n’ roll guitarists. 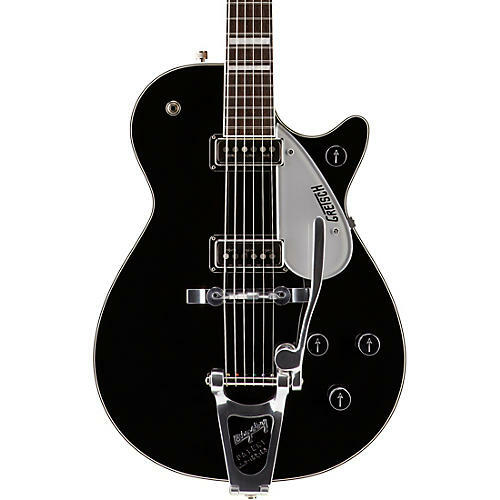 The Gretsch’s G6128T-CLFG Cliff Gallup Signature Duo Jet is a finely crafted celebration of Gallup’s 1954 model. It rocks all the essential ingredients of his time-honored signature sound, including dual DynaSonic pickups, rosewood fingerboard with “big block” pearloid inlays, compensated aluminum bridge with aluminum base, Bigsby B3BBST vibrato tailpiece with black painted trough and fixed arm, classic “arrow” control knobs, flat-wound strings, and a dark-stained headstock bearing Gallup’s signature on the truss rod cover. Includes hardshell case.